Bringing you an epic adventure game for 2–4 players, inspired by a classic monster slashing and looting goodness, converted to a modern board game. In a role of one of the Sanctum heroes, you will embark upon a quest to rid the land of a demonic invasion, fighting your way through countless enemies and gearing up to face the Lord of Demons himself. Sanctum is going to be published in Fall 2019. This is your chance to change history! Throughout time there have been courageous women and imaginative men who changed history, and whose legacy we carry with us to this day. This expansion will bring a ton of new content to the base game, adding new leaders and wonders and military cards so you can change the flow of history. Letter Jam is a 2-6 player cooperative word game, where players assist each other in composing meaningful words from letters around the table. The trick is holding the letter card so that it’s only visible to other players and not to yourself. By doing so, each player gradually learns what letters they’re holding. At the end of the game, by filling in the blanks and rearranging their letter cards, everyone has to find the word hidden within these cards, still without looking at them. In the end, the more players managed to create an existing word, the bigger their common success! 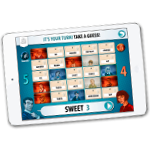 Codenames: Duet XXL, the cooperative version of our popular word association game, brings an improvement over its smaller predecessor with more comfortable play. The Boardgamegeek #1 party game is going online. You can play online with your friends or meet new spymasters and agents within a minute. The amount of words included in Codenames give it unlimited replay value. Moreover, the digital application is easy to expand with more and more words. Endless fun! Note: Some images on this page are not from a final game!